[Ear Heart Music] Aventa Ensemble: Black Box What? Canada’s remarkable Aventa Ensemble performs a percussion heavy program featuring the US premiere of Simon Steen-Andersen’s Black Box Music for percussion solo, amplified box, 15 instruments and video. In this piece, the revered young composer experiments with the stage as instrument. 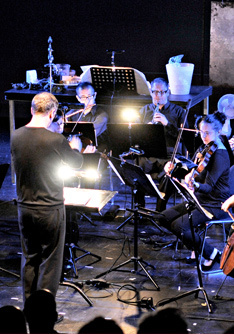 Black Box Music could be said to be a deconstruction of conducting and puppet theater as well as an exploration and exploitation of the audio/visual relations inherent in conducting and staging. Rolf Wallin’s masterful percussion duo Twine for xylophone and marimba also receives its US premiere. Filling out the program are additional works by Laurie Radford, Michel Gonneville, and Kaija Saariaho. In Laurie Radford’s _fuse!_, live audio signal processing of the instruments contributes an additional timbral element to the work, by extending individual sounds and the ensemble as a whole, as well as serving as a virtual ensemble that arises from and comments upon the sounds and gestures of the instrumentals. Norwegian composer Rolf Wallin’s music combines an intuitive freedom with a rigorous mathematical approach, such as use of fractal algorithms to construct melody and harmony, resulting in a music that often hints at the influence of Ligeti, Xenakis and Berio. Twine for xylophone and marimba consists of two streams of sound, both emerging from wood, but still slightly different: the bright and hard versus the dark and soft. The piece demands absolute technical brilliance, an almost telepathic rhythmic contact, and a highly developed musical intuition. Canadian composer Michel Gonneville has created a work inspired by Margaret Atwood’s non-fiction book on the nature of debt, Payback: Debt and the Shadow Side of Wealth. Gonneville’s work Cantate de la dette perpétuelle / Cantata of the Unredeemable Debt, composed for the Aventa Ensemble, features the full ensemble, plus six soloists (three singers and three percussionists) who move freely throughout the hall. Described as “one of the most original compositional voices of our time” (Denver Post), Kaija Saariaho is a leading Scandinavian composer of her generation. The Tempest Songbook is a collection of short works for soprano, baritone and ensemble based on William Shakespeare’s text. Ear Heart Music “has become a staple in the New York new music soundscape.” (Time Out NY) Its thoughtfully designed programs highlighting recent masterworks stimulate creative thought and instill new avenues of perspective in the listener. The consistent level of intelligent and inspiring music-making resonates in the mind and body. Shows include electronic processing, performance art, visual art, film, and dance, providing deeper context for the music. Unique artist pairings, diverse programming, and the integral incorporation of new work all contribute to Ear Heart Music playing a major role in reshaping the chamber music landscape for the 21st century. All quotes from Time Out NY.